As the prices of video game prototypes (and just about everything else) continue to soar, reminders of why I continue this costly project are needed more than ever. An old acquaintance by the name of Sean MacKenzie recently helped get my focus back on the real meaning behind this site: to inspire and educate others about the importance of software preservation. No one person can dump and document them all. The greater goal is not my personal bankruptcy; it’s to rally more people to pitch in for the sake of saving gaming history. Sean offered to volunteer his own time and money to get on board with that mission. He couldn’t have picked a better time. Sean is the former webmaster of a Nintendo Entertainment System fansite called NES Zone that began in 2003 when such pages not only still existed but thrived among a small, insular pack of high school and college kids (I was one of them). 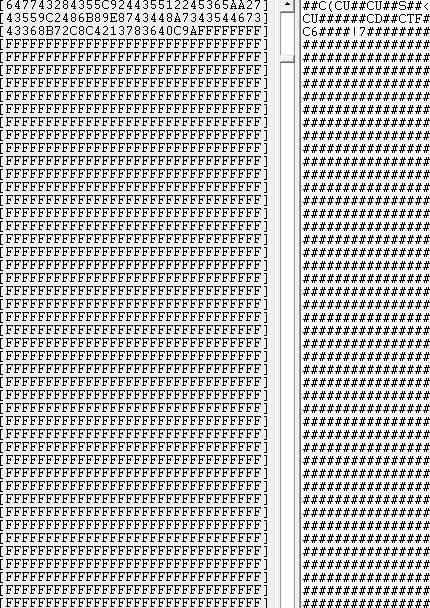 Today that once energetic, interconnected band of websites largely lies buried in a virtual graveyard of 404 errors. What has risen in its place is a far more disorganized scattering of glossy blogs and talking head streaming videos all vying for the wandering eyes and ears of the postmodern old school gamer. Back then, however, when HTML and frames still reigned supreme, a charming sense of nostalgic naivety defined most classic gaming sites, with copious sprite .gifs serving as a kind of early form of meme self-expression. 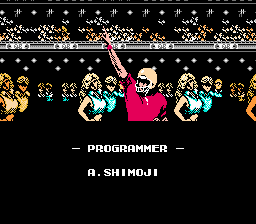 NES Zone, for example, used to have on its site’s banner the grinning face of Magic Johnson from Magic Johnson’s Fast Break like a star constellation against a repeating Gyruss space background. 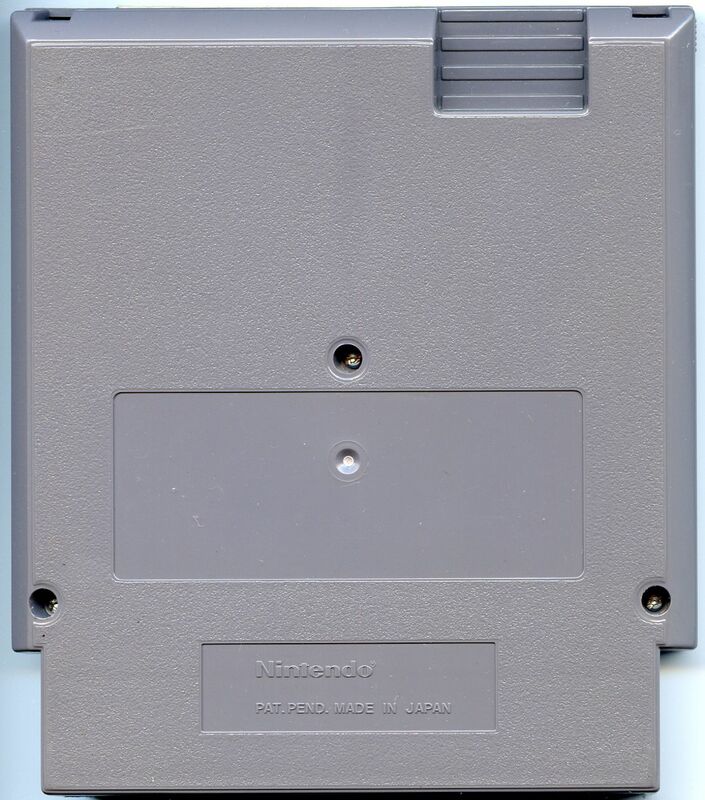 To a younger crowd who had grown up on the Nintendo, the radical blast-from-the-past combination was a welcoming invitation to nestle in between marathons of classic gaming and IRC idling, to take advantage of the remaining care-free summers before they would soon enough lose their luster and morph into ordinary work months. Sean didn’t want to talk about old times, though. 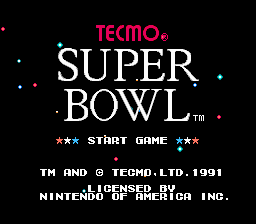 He had purchased a Nintendo Entertainment System prototype of Tecmo Super Bowl and asked for assistance on dumping and documenting its data. Prototype preservationist Brent “Skrybe” Adams, another veteran who hasn’t given up the fight, took on the task of extracting the ROM image and scanning the cartridge. Afterwards, Sean passed the binary on to me to have a look-see. 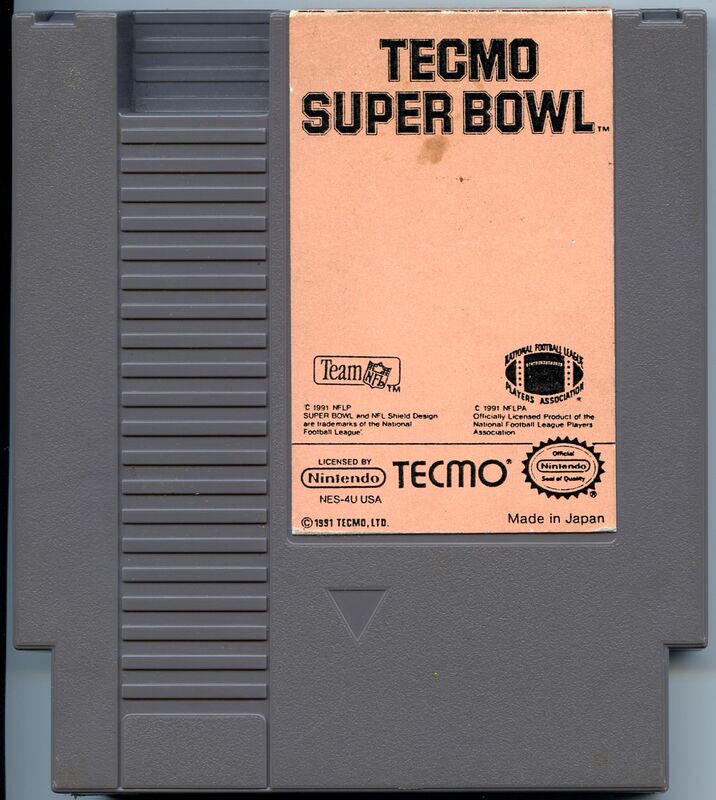 Sean purchased his Tecmo Super Bowl in May of 2013 from a man named Rob Moore. 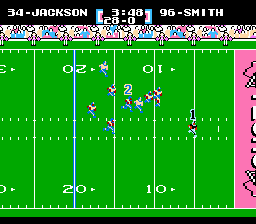 Moore picked up the cartridge and three other Nintendo Entertainment System prototypes, Micro Machines, Teenage Mutant Ninja Turtles II, and Touchdown Fever, at a North Carolina thrift store in or around 1998. 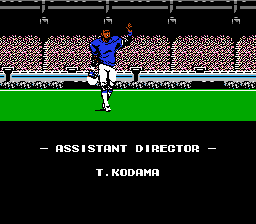 That’s a long way away from Tecmo’s U.S. headquarters on the other side of the country in Carson, California. 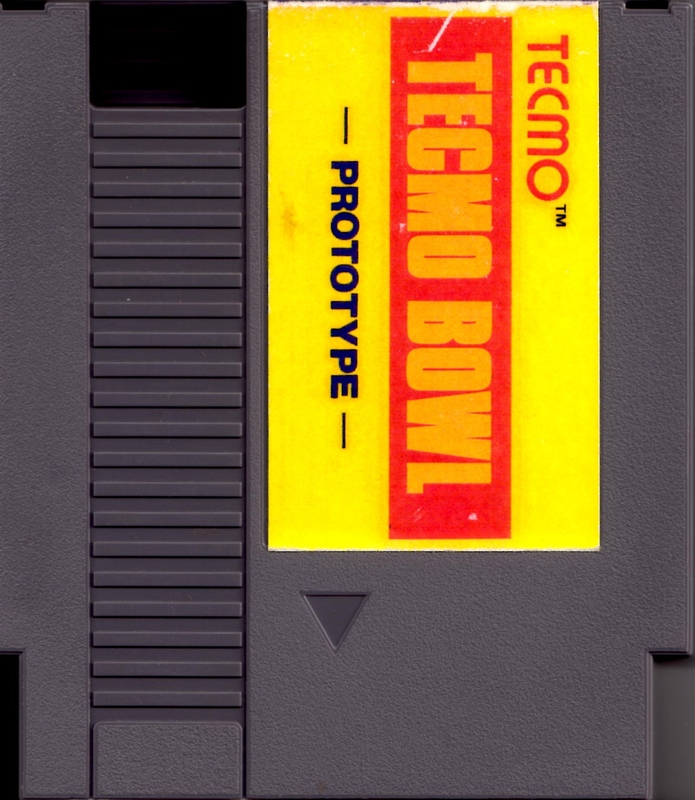 A number of these Tecmo Super Bowl prototypes reside in private hands, but none of them have seen public distribution or any kind of documentation at all before Sean stepped up. The cute peachy front label may not necessarily scream “rough and tough gridiron football action,” but the clean outer aesthetic does make for a more visually appealing cartridge than the usual war-scarred prototype that looks like it just flew back from a few tours in Afghanistan with some blood-curdling stories to tell. 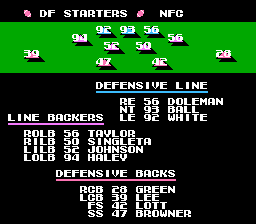 By comparison, the softer color is far less hard on the eyes than the garish mustard-yellow labels seen on this Tecmo Bowl Nintendo Entertainment System prototype. It could just be my weird way of perceiving things, but whenever I see that cartridge, “cubist hot dog” always comes to my mind. 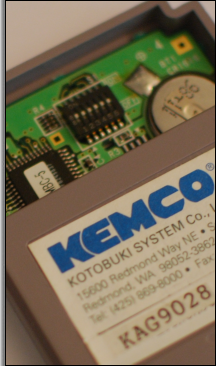 The fancy labels on both prototypes, in addition to the relatively amble supply of cartridges, suggest to me that Tecmo sent these out to the press who weren’t mindful enough to mail them back after they were done writing about the games. You may recall from my interview with a former professional newspaper game reviewer that that sort of “forgetfulness” seems to have been plenty prevalent back in the day. These review copies actually account for most of the classic game prototypes that are found and sold on the black market today. 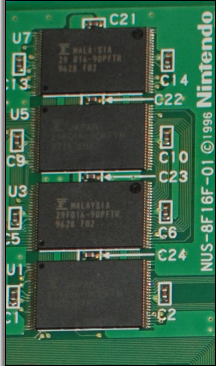 The NES-TKEPROM-02 development board inside of the Tecmo Super Bowl prototype contains three EPROMs: a single CHR chip dated August 17th, and two PRG chips with the shared date of August 27th. 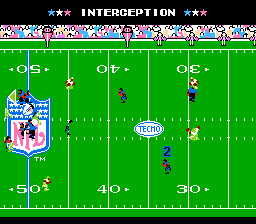 Tecmo Super Bowl tackled American and Japanese store shelves three months later in December of 1991. 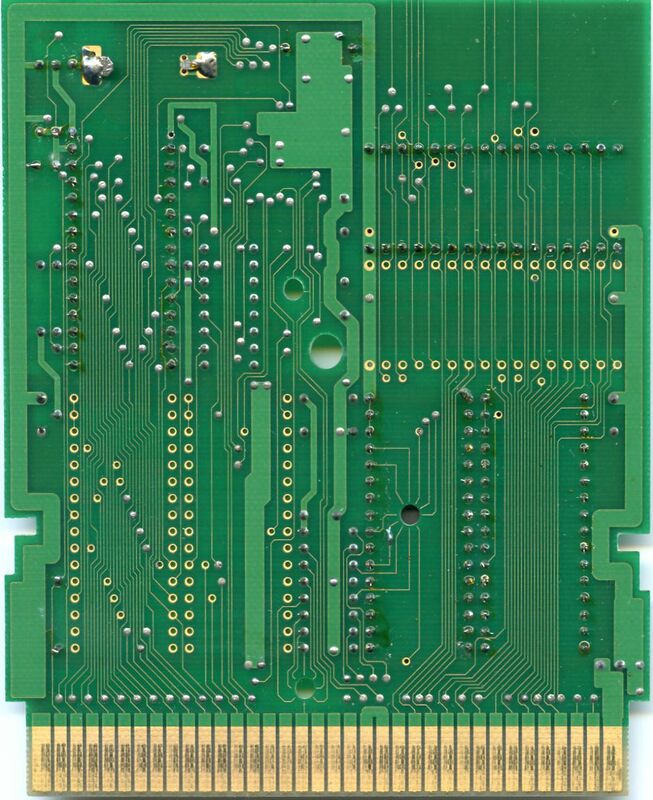 The squarish EPROM stickers are a fixture of Tecmo Nintendo Entertainment System prototypes, and they again make an appearance here in blue. I have written in-depth about Tecmo Bowl, essentially calling it the granddaddy of arcade sports games, but its revolutionary sequel arguably made an even greater impact on the gaming industry than the original. 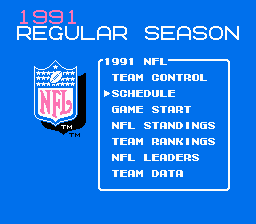 The greatly improved Tecmo Super Bowl marked the first time that gamers could choose NFL players with matching skills and abilities from all 28 NFL teams and lead them through an entire 17-week schedule season. Battery back-up kept all of the rankings, team stats, and the physical conditions of players, including player injuries. At any point during the season mode, one could switch teams and go against a friend, act as the coach and draw up a playbook, or just sit in the stands as a spectator and watch the computer duke it out with itself. 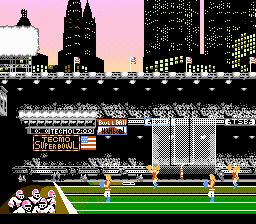 The replay possibilities were staggering for a video game at that time. 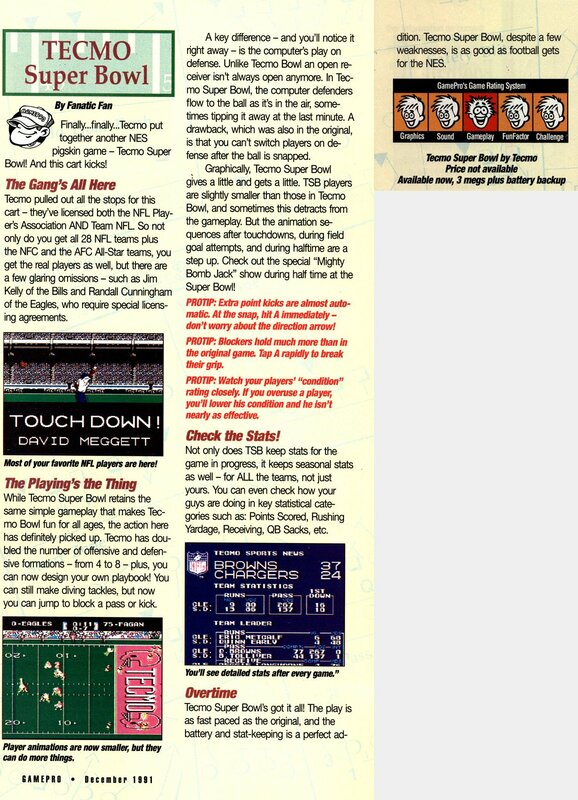 For football fans in 1991, there was no other title like it, and if you talk to die-hard Tecmo Super Bowlers today, who continue to update the rosters every year, they will still profess that there is not a more satisfying and addicting sports game out there (apart from the real thing). Most importantly, the sequel’s advancements never bog down the classic over-the-top gameplay. 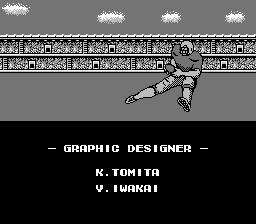 The Tecmo Bowl series brilliantly engages all types of players, even those without any interest in the sport whatsoever, by offering at its core a simple, wholeheartedly fun pick-up-and-play experience. 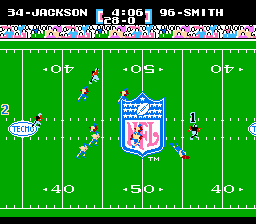 As proof of its lasting universal popularity, NFL Films released a 30-minute documentary about the marvel of Tecmo Super Bowl nearly 23 years later in 2012, placing a spotlight on the competitive tournaments that are held annually in sports bars across the country (think: The Wizard for highly competitive aging Nintendo jocks). 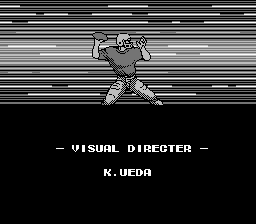 One of the ranked players profiled in that short film went on to propose to his girlfriend through a modified Tecmo Super Bowl title screen (link). 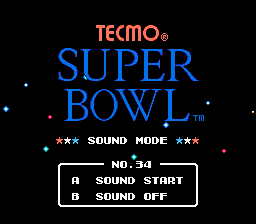 To call Tecmo Bowl merely a “cult favorite” at this point would be more than an understatement to that happy, Tecmo-loving couple and the untold others whose eyes light up whenever the gaming phenomenon is brought up in conversations about all-time Nintendo classics. 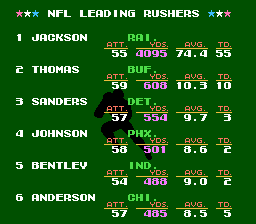 You can thank in part Bo Jackson for cementing the game’s legacy. 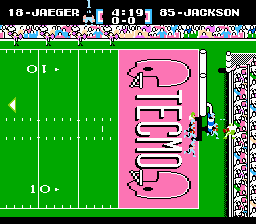 Bo makes his triumphant return in Tecmo Super Bowl, and he is just as inhuman and unstoppable as before. Interesting fact: This powerhouse player’s rushing stats cannot exceed 4,095 yards. 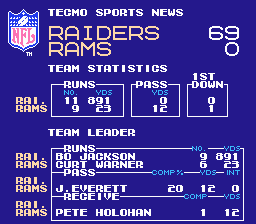 [Update: Brent Adams pointed out that if Tecmo allotted three digits for the rushing yards counter, it would max out at the hexadecimal “FFF,” which translates to 4095.] 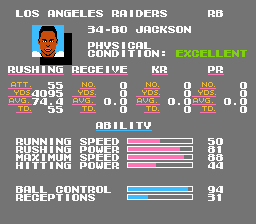 That strangely specific number is where the counter maxes out, otherwise Bo could potentially collect over 9,999 rushing yards in a single season by taking the ball back to the first yard line every time and just charging the field. (Not to worry; it’s good exercise for him.) Going over that 4,095 yard mark will result in Bo’s average rushing yards actually decreasing over time because the counter can’t keep up with his steam-engine pace. 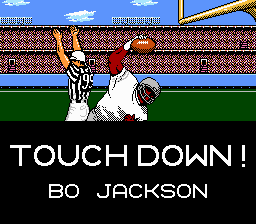 That’s right; among everything else, Bo even knows how to break Tecmo. How fitting for one of video games’ most broken characters. Bo’s running strategy is quite basic but nevertheless incredibly effective: zig-zag up, down, and across. 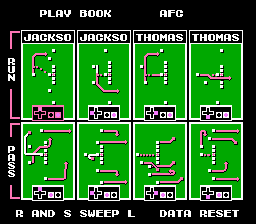 Despite the simplicity that’s involved, witnessing Bo rush the entire Tecmo field using those three moves alone is truly something else. Like a ballet performance, the give-and-take between him and the opposing team’s entire 11-man defense is delicate, almost graceful. Bo leads, and the others follow, doing their best impressions of grands jetés on the digital green AstroTurf. The resulting show is as beautiful as Swan Lake. It’s breath-taking and moving and exhilarating, and when Bo finally reaches the end-zone and a cutscene plays of him spiking the ball, you’ll almost feel like you should throw flowers at your television screen and yell, “Encore! Encore!” That is, unless you’re not the Raiders. Then you’ll want to scream something entirely different. 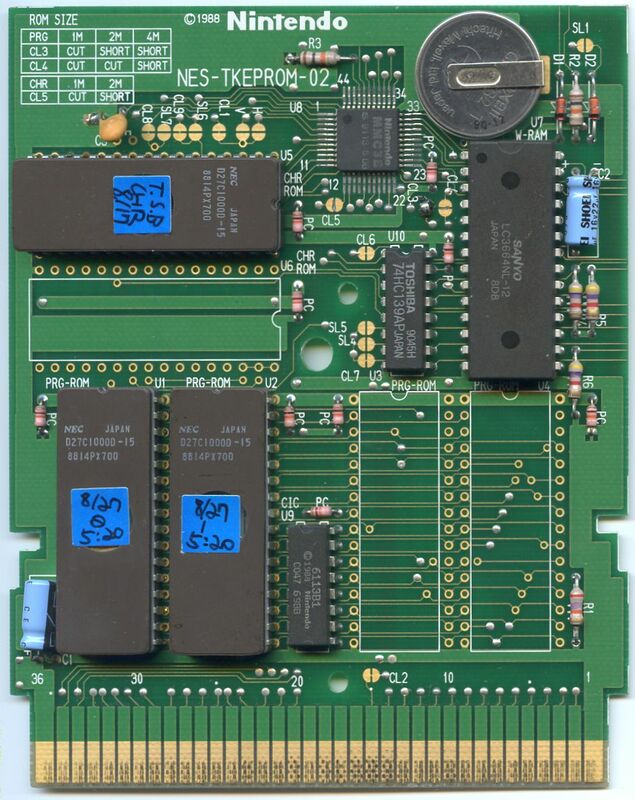 When Sean handed over the prototype file, he had already noted some differences on his own while playing the cartridge on a real Nintendo system. Most of his findings appeared to be bugs. Sean went on to remark on a couple of in-game quirks that occur after a cutscene plays. That’s not all. The prototype also suffers from multiple personalities. Unfortunately, during my playthroughs, I found it difficult to recreate these quick random events, so it is not entirely known what triggers them. 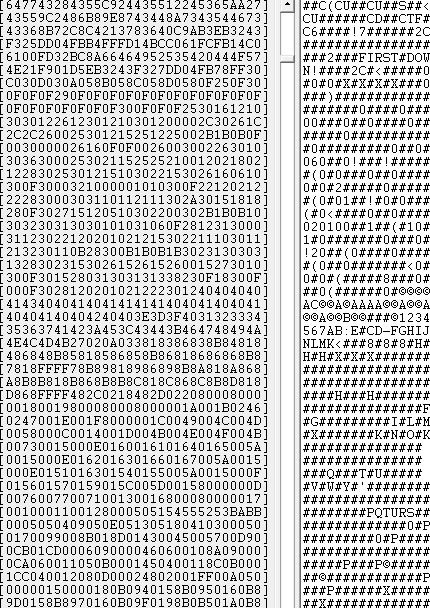 Other kinks in the code are easier to spot. No vertical screen boundaries exist in the prototype, so it is possible to run through the cheerleaders on the sideline and past the crowd at the top of the screen, only to then pop back up at the bottom of the field. Sean’s great hearing pinpointed a minor music driver change as well. Upon reviewing his audio recordings, I could detect an audible difference at the end of the clip, and perhaps even in the amount of crowd noise, too. After using the hidden Sound Mode to compare the prototype and the retail’s audio (left+B on the title screen), no changes in that track could be heard (the crowd sound effect is layered over the tune), so something is certainly affecting the music during gameplay. In fact, after running all 60 tracks in the game’s Sound Mode, the prototype appears not to have any different music or sound effects at all. 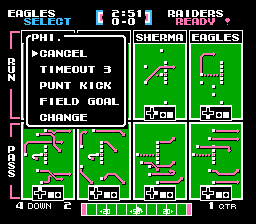 Another change is seen on the fourth down: the Timeout/Punt Kick/Field Goal prompt does not open up automatically in the prototype. 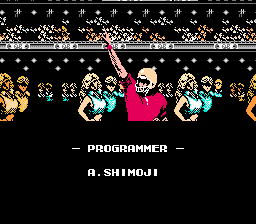 During the Programmer staff credits, the background crowd graphics display ever-so-slightly different patterns in the upper balcony’s spectator sprites and a few fine white lines near the top of the screen in the prototype. 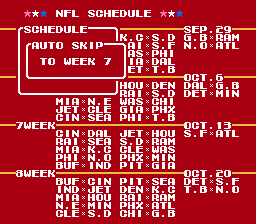 Choosing a week to Auto Skip on the NFL Schedule menu in the retail version causes a sound to play. That sound is missing in the prototype. 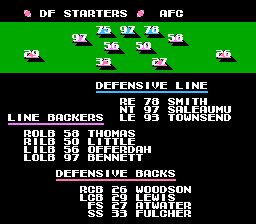 At the top of the AFC DF Starters menu, the prototype assigns Townsend the number 75, not 93. At the top of the NFC DF Starters menu, the prototype assigns Johnson the number 55, not 52. In addition to that, Singletary is assigned the number 99 rather than 50. In the Play Book, the prototype highlights only one button on the running plays’ Nintendo Entertainment System controllers. 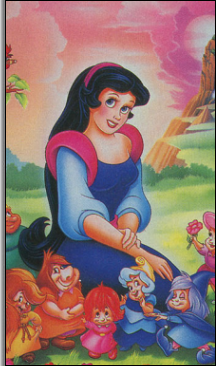 That covers all of the noticeable in-games differences. 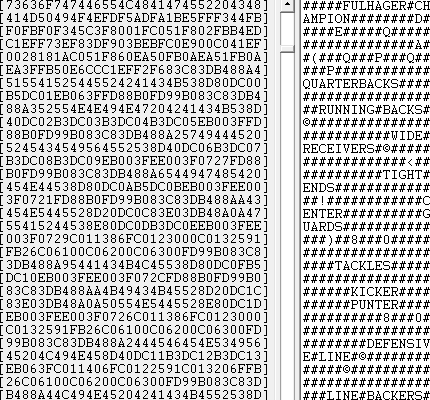 There are, however, quite a few spots in the raw data where the retail code is blanked out, which accounts for most of the byte changes in the prototype. 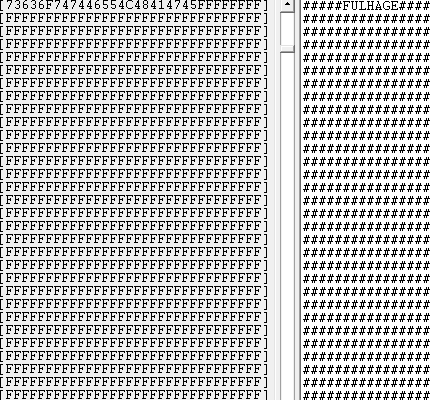 Most interesting of these are the two empty spots where the prototype contains text (0x2E20-0x300F and 0x3CE0-0x400F). Not to be outdone, the retail code has one area (0x35B80-0x35BD2) with the words “PROGRAM ERROR” and “CODE STACK” where the prototype has nothing. This is a crash handler, a debugging feature in the retail version that triggers whenever a code break occurs. 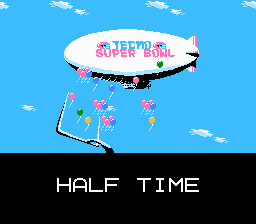 All told, this Tecmo Super Bowl prototype shows a near-complete build in need of some last-minute tweaks. 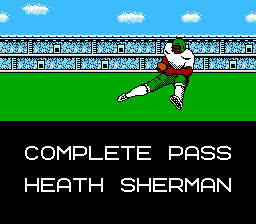 A big thanks goes out again to Sean for his kind generosity, Brent for his dumping and scanning skills, and Randall “QB Eagles” Cunningham for his uncanny ability to hurl 100-yard passes.